My original plan was to sauté watercress with sesame seeds and garlic. While turning on the stove I realized that just 2 bunches of watercress will not be enough ! So , I peeked in the refrigerator just to find the cabbage wanting to relocate to a warmer place and the naughty peanuts wanted to play with the sesame seeds…so here is how the Naughty Peanuts with Watercress and Cabbage was created! 1. In a warm pan, add oil and sauté ginger garlic , sesame seeds and peanuts. 2. Add cabbage and cook for 5-7 mins. 3. Then, add watercress and sauté it for 2 mins. 4. 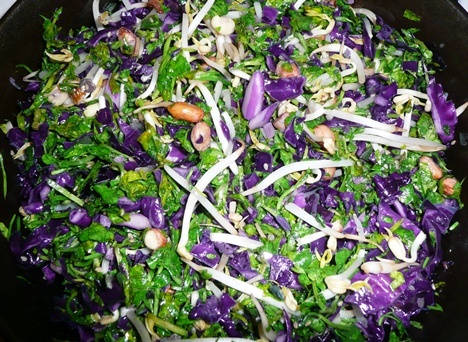 Turn off the flame and add the mung bean sprouts, vinegar, lemon juice and sugar. Watercress has a hot, peppery taste, like that of radishes, though it does not have that strong bitterness which is sort of a characteristic of wild mustards. If you still find it bitter add some vinegar and or lemon. Watercress bags a place in the category of one among the world’s most healthful vegetables which are excellent for restoration. The phytochemicals in watercress enhance detoxification pathways in the liver (esp . sulfation). It comprises of high amounts of calcium, beta carotene and iron. Not only this, it is also rich in bioflavonoid, vitamin C, vitamin B1, B2 & E and minerals like sodium, manganese, zinc, cobalt, copper, vanadium, sulfur, iodine and phosphorus. Cabbage can provide you with some special cholesterol-lowering benefits if you will cook it by steaming. The fiber-related components in cabbage do a better job of binding together with bile acids in your digestive tract when they’ve been steamed. When this binding process takes place, it’s easier for bile acids to be excreted, and the result is a lowering of your cholesterol levels. Raw cabbage still has cholesterol-lowering ability-just not as much as steamed cabbage. In one recent study, short-cooked and raw cabbage were the only types of cabbage to show cancer-preventive benefits-long-cooked cabbage failed to demonstrate measurable benefits. BTW, what is watercress called in Hindi, Gujarati, Kannada, Marathi?